MTech USA Serrated G10 Textured Handle Fixed Blade Knife | BUDK.com - Knives & Swords At The Lowest Prices! 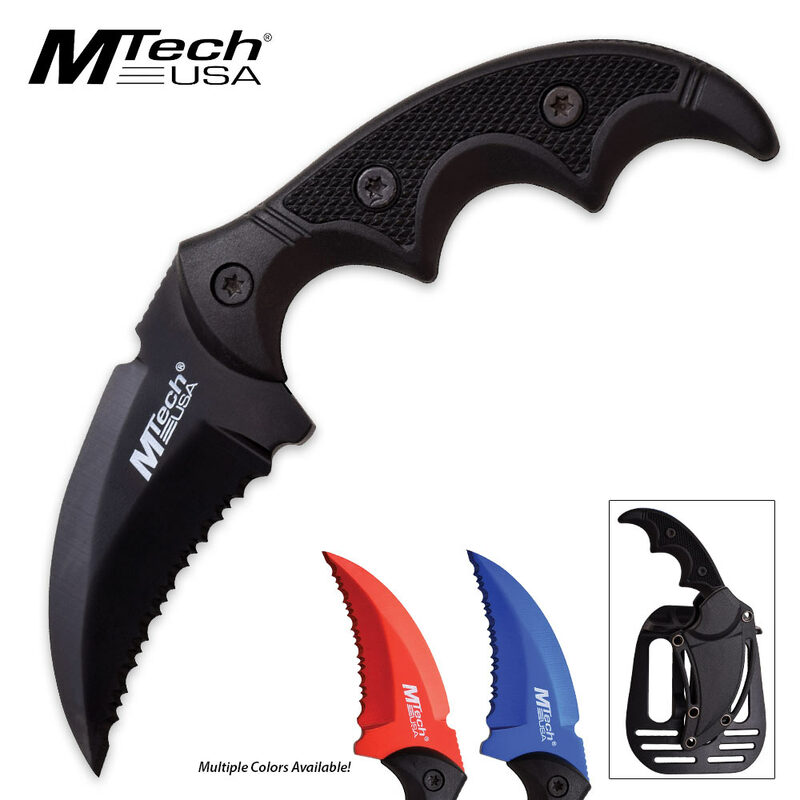 MTech USA has added to its offerings a line of fixed blades with your choice of blade color. Nothing looks cooler than a knife that has a blade that just doesn’t look like your traditional silver color. These knives really stand-out when you take them out of the sheath. This knife has a 3” stainless steel full serrated blade that comes in your choice of black, blue or red. The matte aluminum with a G10 texture gives you a secure and slip-free grip. It also includes a tactical paddle holster sheath and is 5” overall. This is my first time making a purchase from budk. I ordered this knife a week and a half ago. My other edc knife was not legal length to carry on belt in the state were I live. So I had to get something that was a 7in blade or under not including the handle. So I don't get introuble. If I'm contacted by the law for any reason. Im very impressed by the well built paddle sheath as well as the quality of this little krambit knife. It was very sharp outta the box and ready for protection. It's a tactically perfect edc krambit defense knife. It fits right in my hand nicely. I have medium sized hands and Statistics say knife fights are extremely close quarters. Up in your face or 9 times outta ten fight ends up on the ground which could leave you very vulnerable. This knife is really concealable. It can be pulled out at last resort as a self defense deturent.. Before your cause serious bodily harm by an attacker. You can unholster it without your attacker seeing it to enter it in the fight. Plus the 3 in. Blade is perfect to still use for hooking and trapping limbs. while still slashing in extreamly close quarters. It can still stay very concealable and sneaky. but this to me is a last resort slashing tool to go on your belt right before your magizine pouch,peperspray, baton, or penetration knife. I will be ordering my edc Penetration defensive knife pocket knife. If the need arises to protect myself or my girlfriend or my kids from a selfless act of violence. I thank budk for quality knives for an affordable price. Satisfied and I will definitely be a return customer. Simply astounding. Quality is way too good, blade fits perfectly into tactical sheath. Tactical indeed. Ordered 2 just to see how they arrive, and gee golly, they are exactly as i imagined. Excited to order all colors. This little knife fits very nicely into the included sheath. the holster or whatever is solid and durable. the knife comes out and goes in very easy. The serrated blade is sharp and would hurt. the handle has a nice texture and feel to it. Only complaint is the blue paint is coming off the blade but i expected that. Overall amazing deal for 6 bucks! I bought this for my wife and she loves it. She immediately clipped it onto her purse. It's a nice little blade, comfortable in the hand and the sheath is really nice. When her parents saw her pull it out, they loved it so much we ordered one for each of them too. All in all its a handy little blade and you sure can't beat the price.